Abstract - The Uptime Institute Tier Standard: Topology is an objective basis for comparing the functionality, capacity, and expected availability (or performance) of a particular site infrastructure design topology against other sites, or for comparing a group of sites. 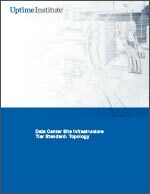 This Standard describes criteria to differentiate four classifications of site infrastructure topology based on increasing levels of redundant capacity components and distribution paths. This Standard focuses on the definitions of the four Tiers and the performance confirmation tests for determining compliance to the definitions. The Commentary, in a separate section, provides practical examples of site infrastructure system designs and configurations that fulfill the Tier definitions as a means to clarify the Tier classification criteria.